Black lightweight wide leg pants "Butler" embroidered in white on the upper left front. Drawstring waist. 80% cotton 17% polyester 3% elastane. 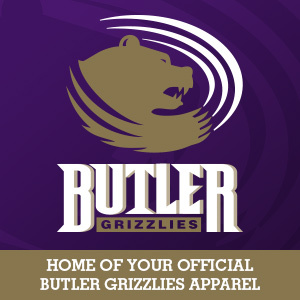 Heathered purple short sleeve tee shirt "Butler Grizzlies" imprinted in white on the front. 50% polyester 25% cotton 25% rayon.